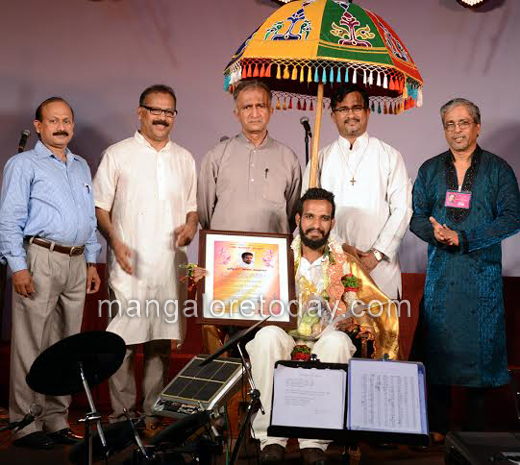 Mangaluru, Nov 02, 2015: Outstanding young Konkani theatre activist and director Christopher D’Souza was conferred the 11th ’Mandd Sobhann-Carvalho Ghorannem Kalakar Puroskar’ at a ceremony held at Kalaangann at Shaktinagar on November 1, Sunday. Fr Vijay Victor Lobo, Director of Sandesha presented the Award to D’Souza. The Award sponsored by Carvalho Ghorannem carries a cash prize of Rs 25000, a citation and a memento. 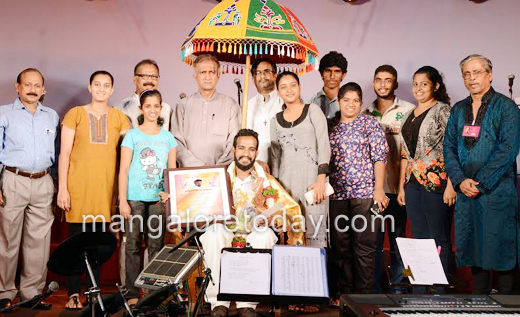 Speaking after receiving the Award, Christopher D’Souza, a graduate from Neenasam who trains theatre artistes and even directs plays for Kalakul, attributed the Award to his team at Kalakul. He also recalled how he was rejected in a drama audition eleven years ago, but moved ahead in life with a strong determination and emerged successful. Dr Pratap Naik from Carvalho Ghorannem, Eric Ozario, Gurkar of Mandd Sobhann, Louis Pinto, President of Mandd Sobhann and others were present. The 167th monthly theatre programme of Mandd Sobhann ’Sur-Thal-Mel, Sumel’ was presented by Mandd Sobhann’s singing troupe ’Sumel’ on the occasion.